I have never seen many books at the store discussing video games (I don’t count game guides) and I only have a few in my collection – some development books from the early 80’s and Phoenix: The Fall and Rise of Videogames. Finding books that talk about arcades is a niche inside a niche as there are very few of them out there. 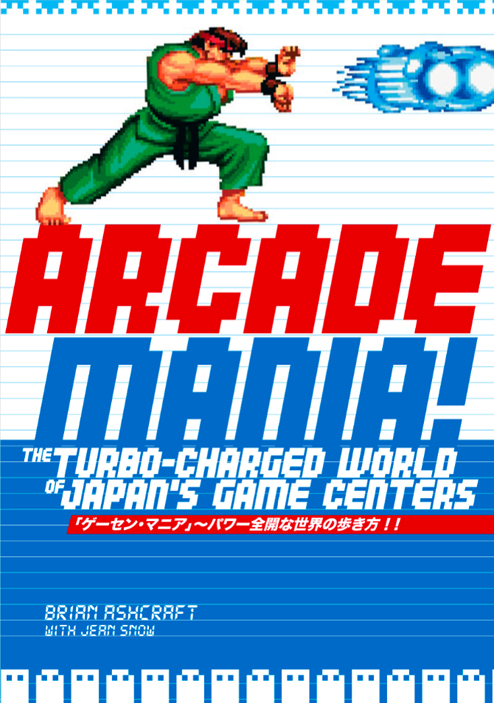 Organized as a guided tour of a typical Japanese game center, Arcade Mania is divided into nine chapters, each of which deals with a different kind of game, starting with the UFO catchers and print club machines at the entrance and continuing through rhythm games, fighting games, shooting games, retro games, gambling games, card-based games, and only-in-Japan games. Arcade Mania isn’t a history book, but packs lots of history in it — from Post War era mechanical games to the late 70s Space Invaders craze to the modern day. Tons of players, developers and random schoolgirls were interviewed while writing the book. And tons and tons of hands-on “research” was done at Japanese arcades throughout the country. We were able to get Crecente and arcade guru Kevin Williams to pen bang up forwards, which was very cool. I’m not sure when this will make it to international markets but I wouldn’t be surprised if it’s soon and when I get my hands on it I’ll have to write up a review about it for AH.